ZENITH lathe are well suited for all common Turning, Surfacing and screw Cutting with high accuracy. 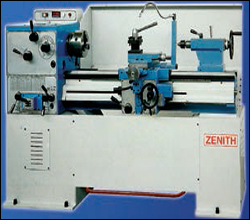 Zenith Lathes are designed for continuous Lights and Heavy jobs. Lathe Machines are made with close grain graded casting, many models & size are available. Zenith Supply mainly two types of precision lathes, CHANGE GEAR TRAIN LATHES AND ALL GEAR HEAD PRECISION LATHES. Others : Main Gear are helical, cross side 18x158, Spindle pulley & Bush, Surface/Center/Compound Screw nut and all in brass. THE BED is made of close-grained cast iron, having unusual strength and long wearing qualities. It is machined and ground to fine finish and is well braced to withstand vibration free operation even under heavy cutting load. HEAD STOCK The flat seat of headstock over the bed is perfectly matched by precision hand scrapping. The hollow spindle runs in a pair of amply dimensioned split gunmetai adjustable bearing and one Thrust Ball Bearing or Heavy duty Taper Roller Bearings. Engagement of feed and screw cutting is prevented by an interlock mechanism. THE TAILSTOCK is of special and sturdy design. Inverted V guides it and flat ways of the bed independent of the saddle guides and has an offsetting drive for taper turning. The body including the base can be clamped to the bed by means of bolt and nut provided. STANDARD Back Plate for Dog Chuck, Dead Centre (hardened and ground), Centre EQUIPMENT Sleeve Traveling and Fixed Steady Rests. One set of 22-machine cut Change Gear wheels, Oil Tray, Motor drive arrangements and Thread Dial Gauge.